• From guerrilla combat in jungle mountain ranges, to recon missions on Mediterranean islands, you’ll travel the world in search of terror threats. • Commandeer vehicles to turn the tide of battle! Navigate close quarter combat down narrow alleys in the back of a jeep, or take out hostile threats by air in hazardous helicopter missions! • Complete breach missions to enter occupied buildings and clear them of any threat! Survive a full on enemy attack in multiplayer assault missions and outshoot your opponent. 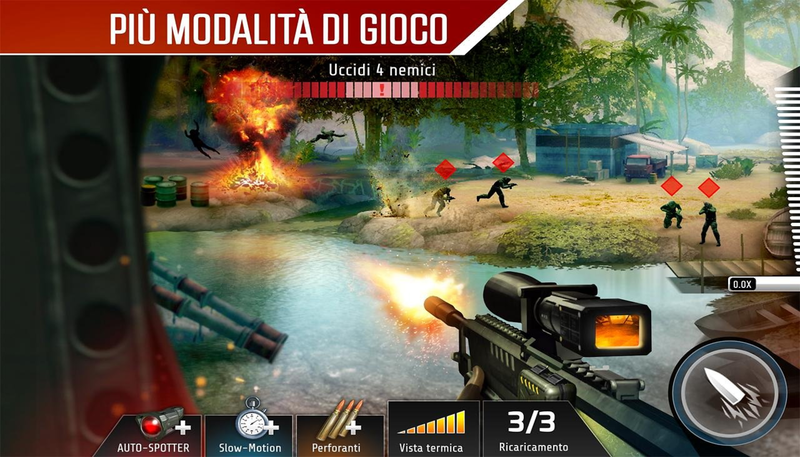 • Move through environments to find the best sniper vantage points and take the all-important Kill Shot! ENEMIES • Encounter different enemy types each with their own strengths and combat objectives. • Seek out and neutralize Flying Drones, Exo-Suit Soldiers, Mechs, Heavy Gunners, Enemy RPGs, Marksmen, Riflemen, and Commando Bombers. 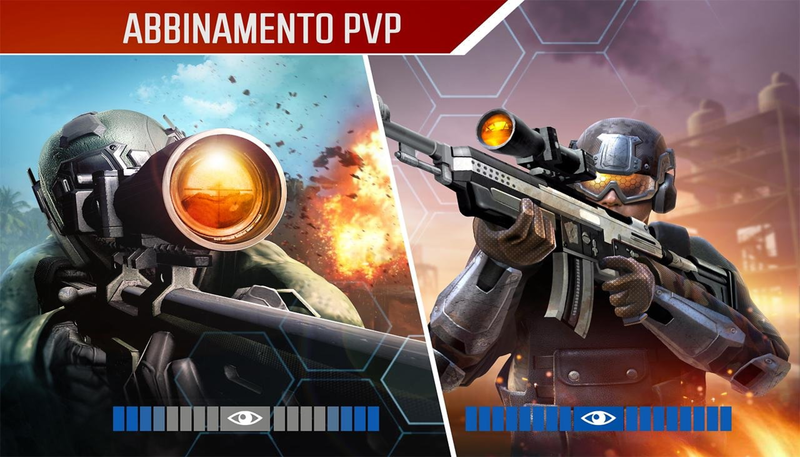 LIVE PVP SNIPER DUELS • Test your skill against other real snipers in live ranked Player Verses Player matches in PVP mode! • Be the hunter before you are the hunted! • Use your heat meter to zone in on the enemy threat. • Find your target. Take aim. Fire! JOIN ALLIANCES AND BOUNTY EVENTS • This time you won't be fighting alone! Build powerful alliances with other players and help each other to be successful completing the high risk missions. 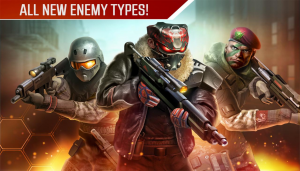 • Discover and kill enemies with bounties on their heads before they can escape! 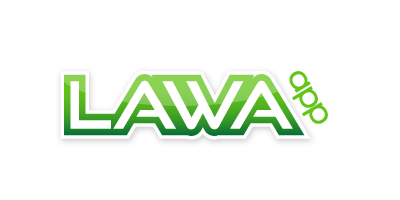 • Friends can join you on missions, spotting the targets and assisting you to terminate enemies. • Full Chat function in game to allow tactical discussions with other players. CUSTOMIZE • Customize your avatar and get Perks to help in the battle! • Unlock and equip cool Gear, including helmets, uniforms, body armour, goggles, facemasks, gloves, boots, and more. 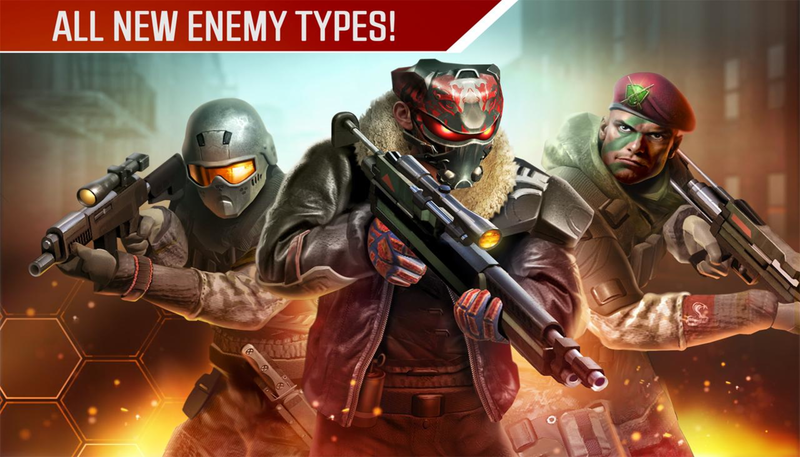 • Get a fresh Kill Shot moment with every victory! Now YOU get to control the Kill Shot camera as the final round zooms towards its target for the ultimate hit!